Sea lion is the common name for various eared seals currently comprising five genera and distinguished from fur seals in the same pinniped family, Otariidae, by lacking the underfur covered with long guard hairs and generally by larger size and a less pointed snout. As otariids, seal lions also are characterized by presence of a pinna (external part of ear). Traditionally, sea lions were placed in their own subfamily; however, recent studies have not justified such a taxonomic separation from the fur seals (Riedman 1990; ITIS 2006; Brunner 2003). Seven species, including one recently extinct (the Japanese sea lion) are currently recognized, placed into the five genera of Eumetopias, Otaria, Neophoca, Phocarctos, and Zalophus. The range of sea lions extends from the subarctic to tropical waters of the global ocean in both the northern and southern hemispheres with the notable exception of the Atlantic Ocean. They are generally found in shallow waters of coastal areas of both with abundant food resources (SW 2008). One of the more remarkable examples of a harmonious relationship between humans and marine animals is the training of sea lions to perform various practical underwater tasks, including locating and retrieving objects of interest and detecting and attaching a clamp and retrieval line to persons approaching a military ship underwater. Hundreds of California Sea Lions sunbathing on Pier 39 in San Francisco. Sea lions are a type of "eared seal"; that is, marine mammals comprising the pinniped family Otariidae and characterized by presence of a pinna (external part of ear), the ability to invert their hind-flippers under the body (aiding land movement), proportionally long and relatively muscular fore-flippers, and a swimming motion using their long front flippers to propel them through the water. There are 16 extant species of otariids placed into seven genera and variously known as either fur seals or sea lions. Until recently, sea lions were all grouped under a single subfamily of Pinnipedia called Otariinae, while fur seals were grouped within the subfamily Arctocephalinae. This was based on the most prominent common feature of fur seals, namely the coat of dense underfur intermixed with "guard" hairs, which is lacking in those known as sea lions. This underfur with long hairs give fur seals a "somewhat grizzled appearance" (Riedman 1990). Recent genetic evidence, however, suggests that Callorhinus, the genus of the Northern fur seal, is more closely related to some sea lion species than to the fur seal genus Arctocephalus. (Wynen et al. 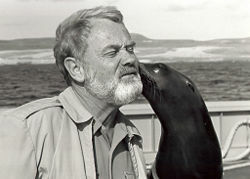 2001), and the fur seal/sealion subfamily distinction has been eliminated from most taxonomies (Brunner 2003; ITIS 2006). Nonetheless, all sea lions have certain features in common: the coarse, short fur, greater bulk, larger prey, less pointed snouts, shorter fore-flippers, shorter and closer foraging trips, and so forth. Their pelage also tends to be lighter and the vibrissae (whiskers) less prominent. For such reasons, the distinction between sea lions and fur seals remains useful, although it is not a formal taxonomic rank. Within Otariidae, fur seals comprise the genera Callorhinus (one extant species) and Arctocephalus (eight extant species). The remaining five genera are classified as sea lions: Eumetopias (one extant species), Otaria (one extant species), Neophoca (one extant species), Phocarctos (one extant species), and Zalophus (two extant and one recently extinct species). Sea lions share with other otariids the ability to turn their rear limbs forward and move on all fours. Sea lions generally are larger than fur seals, with male sea lions larger than the females. Male sea lions average from about 2 to 3 meters (6.5 to 11 feet) in length and from 200 to 1,000 kilograms (440 to 2,200 pounds), while females average from about 1.3 to 2.7 meters (4 to 9 feet) and 50 to 270 kilograms (110 to 600 pounds) (SDZ 2008). The Stellar sea lion (Eumetopias jubatus), also known as the northern sea lion, is the largest of the eared seals (Otariidae); among pinnipeds, it is inferior in size only to the walrus and the two elephant seals. Males on average reach a length of 2.8 to 3.3 meters and weigh 600 to 1100 kilograms (1,300 to 2,500 pounds). Females are only slightly smaller, but have much narrower chests, necks, and general forebody structure; they reach on average 2.5 meters (8 feet) and weigh on average 300 kilograms (660 pounds). Male California sea lions (Zalophus californianus) grow to about 2.4 meters and 300 kilograms, while females are significantly smaller, at 90 kilograms (200 lb) and 2 meters (6.5 feet) long. The Galápagos sea lions (Zalophus wollebaeki) range from 1.5 to 2.5 meters in length and weigh between 50 to 400 kilograms. Male sea lions (bulls) and female sea lions (cows) congregate on land to give birth to pups. Sometime thereafter, the females go into estrous and breed, again on land. Generally this is an annual cycle. However, the breeding cycle of the Australian sea lion is unusual within the pinniped family. It is an 18-month cycle and is not synchronized between colonies. The duration of the breeding season can range from five to seven months and has been recorded for up to nine months at Seal Bay on Kangaroo Island. 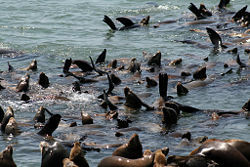 Sea lions eat fish, mollusks (squid, clams), and crustaceans (crabs), and stellar sea lions eat other seals (SDZ 2008). Generally, the food is swallowed whole, such as tossing the fish until it can be positioned to be swallowed headfirst, while using its hard back teeth to crush food with a hard shell (SDZ 2008). Their sensitive, long whiskers (vibrissa) attached to the upper lip can help a sea lion locate food in the dark (SDZ 2008). GiGi, a sea lion trained by the U.S. Navy for underwater recovery, nuzzles merchant mariner Capt. Arne Willehag of the USNS Sioux during a 1983 training session. Some species of sea lions are readily trainable and are often a popular attraction at zoos and aquariums. The archetypal circus seal performing behaviors such as throwing and catching balls on its nose and clapping is almost always, in fact, a sea lion. Sea lions have been trained by the U.S. Navy's Marine Mammal Program for military purposes (Leinwand 2003). They have been deployed in the Persian Gulf to detect and place a clamp with an attached rope on swimmers or divers approaching ships (Leinwand 2003). Their ability to see in near-darkness and their exceptional directional underwater hearing allows them to detect and attach recovery lines to objects such as mines. The Moche people of ancient Peru worshiped the sea and its animals, often depicting sea lions in their art (Berrin and Larco 1997). Integrated Taxonomic Information System (ITIS). 2006. Scientific Name: Otariidae Gray, 1825. Integrated Taxonomic Information System-North America TNS 180615. Retrieved July 3, 2008. King, J. E. 1983. Seals of the World, 2nd edition. Cornell University Press, New York. ISBN 9780702216947. San Diego Zoo (SDZ). 2008. Mammals: Sea lions. Zoological Society of San Diego, Animal Bytes. Retrieved July 4, 2008. Sea World (SW). 2008. Sea lions and fur seals. Sea World Animal Bytes. Retrieved July 4, 2008. Weckerly, F. W. 1998. Sexual-size dimorphism: Influence of mass and mating systems in the most dimorphic mammals. Journal of Mammalogy 79(1): 33–42. Retrieved July 3, 2008. Wynen, L. P. et al. 2001. Phylogenetic relationships within the eared seals (Otariidae: Carnivora): Implications for the historical biogeography of the family. Mol. Phylog. Evol. 21: 270–284. Retrieved July 3, 2008. This page was last modified on 21 August 2008, at 16:16.